Solar wind particles generate the aurora phenomena in the Earth’s atmosphere. Our nearest planetary neighbors, Mars and Venus, have no oceans or lakes or rivers. Some researchers have speculated that they were blown dry by the solar wind, and that our Earth escaped this fate because its strong magnetic field deflects the wind. However, a debate has arisen over whether a magnetic field is any kind of shield at all. The controversy stems from recent observations that show Mars and Venus are losing oxygen ions from their atmospheres into space at about the same rate as Earth. This came as something of a surprise, since only Earth has a strong dipolar magnetic fieldthat can prevent solar wind particles from slamming into the upper atmosphere and directly stripping away ions. "My opinion is that the magnetic shield hypothesis is unproven," said Robert Strangeway from UCLA. "There's nothing in the contemporary data to warrant invoking magnetic fields." Each of the three planets is losing roughly a ton of atmosphere to space every hour. Some of this lost material was originally in the form of water, so this begs the question: How did the planets end up with vastly different quantities of water if they are all "leaking" to space at similar rates? "The problem is in taking today's rates and trying to guess what was happening billions of years ago," explained Janet Luhmann of the University of California, Berkeley. She believes Earth's magnetic field could have made the difference in the past when the solar wind was presumably stronger. "People aren't putting all the cards on the table," Luhmann said. "We can't say that magnetic fields are unimportant from the current data." Both Luhmann and Strangeway agree that sorting out what makes one planet wet while another is dry will require more data on how the atmospheric loss depends on the sun's output. The main driver of ion escape from planetary atmospheres is the solar wind, which is a high-speed outflow from the sun consisting mostly of protons and electrons. Because these particles carry a charge, their paths bend when they encounter a magnetic field. For non-magnetized Mars and Venus, the solar wind basically barrels straight into the upper atmosphere and scoops up ions and carries them into space. Warth's magnetic field provides a barrier to the solar wind, called the magnetosphere, but ions still get stripped away through a circuitous route. 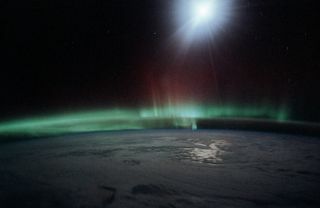 Essentially, the solar wind interacting with the Earth's magnetic field transfers some of its energy into the upper atmosphere in the polar regions. The auroras that are visible at high latitudes are one manifestation of this transfer. But it also heats up atmospheric ions enough that they escape up out of the poles, forming Earth's "polar ion outflows." "The magnetic field is an obstacle to the solar wind, but it is also a funnel," Strangeway says. The effect of the solar wind on Earth is less uniform than on Mars and Venus, but apparently the net loss rate is about the same. Basic physics suggests that this momentum has to go somewhere, and according to Strangeway, it goes into the polar region atmosphere to energize ions there to velocities sufficient to escape Earth’s gravity. The presence of a magnetic field changes the mechanism for this momentum transfer, but the end result is similar. At least, that seems to be the case now. Mars, Earth, and Venus. Only Earth has an active magnetosphere, yet all three worlds are losing their atmospheres at similar rates. The planets are currently losing a few hundred grams of ions per second, but this loss is spread over a very large region of space, so it is a challenge to measure accurately. Satellites in orbit around Earth have detected high-speed ions coming out over the poles, but scientists are not certain how many of them actually escape into space, rather than recycle back into the atmosphere through the Earth's magnetosphere. Observations at Mars and Venus have been harder to come by. Mars Express (orbiting Mars since 2003) and Venus Express (orbiting Venus since 2006) have provided much better constraints than previous planetary missions. "Right now the rates for the three planets are about the same for certain ions," Luhmann says. "No one is debating that." Other ions besides oxygen have been measured escaping into space, such as ionized carbon monoxide and carbon dioxide molecules, which also include oxygen. Hydrogen ions are also being lost, but they are difficult to distinguish from solar wind protons. Even so, researchers assume that approximately two hydrogen atoms escape for each oxygen. (The reasoning is that if this were not the case, the atmosphere would have long ago turned highly oxidative or reductive). The net effect is the loss of H2O molecules. Researchers convert the oxygen ion loss rate into an equivalent water loss rate, and they then try to estimate how much water has been stripped from each planet over their long histories. Artist's concept: Disappearance of the ancient magnetic field may have triggered the loss of the Martian atmosphere. Mars is the favorite example because the planet's geology indicates that there was a large amount of liquid water on the surface 3.5 billion years ago. We have less evidence for Venus, but it too was likely wet in the past. "All three planets had a decent water budget to start with," Luhmann said. Strangeway has calculated how much water each planet should have lost to space, assuming the current rates have remained constant over the last 3.5 billion years. Imagining this water spread evenly over the surface, Mars, Earth and Venus would have each lost a layer of water 30, 9 and 8 centimeters thick, respectively. "That's not a whole lot," Strangeway conceded. It's definitely not enough to explain the Martian geological features. One caveat is the loss of neutral atoms, which go largely undetected by current space instruments. Mars is likely losing many more neutral atoms than its counterparts. This is because Mars is smaller and thus has a weaker gravitational hold on its atmosphere. Certain chemical interactions can give neutral oxygen atoms enough speed to escape Mars' gravity. This neutral loss might help explain why Mars is dry, but it can't explain why Venus is also without water. The escape velocity on Venus and Earth is too high for neutral loss to be significant. "Venus is trickier," says Strangeway. Something must have been different in the past to explain why Venus has 100,000 times less water than Earth. One difference was the sun. We don't have a direct record of the sun's history, but astronomers can study other stars that are similar to our sun at an earlier age. These young sun-like stars appear to be more active, with possibly stronger winds and more ultraviolet light emission. Therefore, it's likely that our sun was stripping planets of their atmospheres at a faster rate in the past. Luhmann argues that the Earth's magnetic field may have been a better shield against a more active sun. In comparison, the loss rates on defenseless Venus and Mars could have gone up by a factor of a thousand or more, relative to Earth. "I'm very cautious," he said. "I don't know enough to say how the young Sun would interact with a planetary magnetic field." The sun is constantly emitting dangerous radiation, but the magnetic field of Earth is thought to protect us from most of the harmful effects. One way to investigate the role of magnetic fields in the past is to observe what happens now during a solar storm, when the solar wind gusts violently. Several solar storms (or more technically "coronal mass ejections") erupt from the Sun every day during peaks in the solar cycle, but only a few storms pass over Earth each month. When they do, satellites can be knocked out, and radiation can increase to dangerous levels over the poles. At the Earth, solar storms also accelerate atmospheric erosion, but more accurate measurements are needed. ESA's Cluster satellites are collecting data on our planet's magnetosphere and solar wind interaction. This information will improve models on the "weather" in the upper atmosphere, so scientists can better model atmospheric escape and how it depends on the solar wind and other inputs. For Mars, the upcoming Maven mission from NASA will study ion and neutral losses and test whether these rates change during disturbances in solar activity and the solar wind. If Strangeway had to guess, he would say the data will show that the difference between magnetized and non-magnetized planets will be slight. But he doesn't have any alternative mechanism for guarding our planet's water supply. "We have to go back to square one," Strangeway said.